If you enjoy a day out watching live sport, or simply doing something different with friends and family, there’s no better place to be than Scotland! Entertainment and sport go hand in hand with venues such as the SSE Hydro, BT Murrayfield Stadium and Emirates Arena captivating crowds with events like the World Gymnastics Championships, international athletics and cycling, Six Nations rugby and Davis Cup tennis. But that’s just the tip of the sporting iceberg with top-class spectator events taking place every week. But how to ensure you don’t miss out? That’s where SportonSpec comes in! Join the SportonSpec Club for free – simply enter your email and click ‘subscribe’ – to receive a weekly newsletter direct to your inbox every Thursday. As recommended by Visit Scotland, it brings the best of Scottish spectator sport to your fingertips and is a convenient reminder of the all weekend’s action: we can’t say fairer than that! The newsletter also has news of promotions and regular ticket giveaways to some of the top sporting events. Variety is the spice of sporting life and in the last year alone there have been over 500 events from some 40 differents sports to choose from. 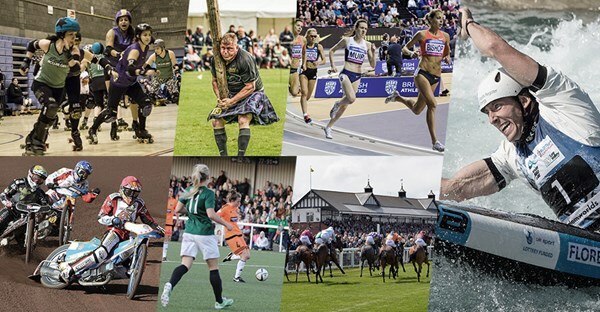 From beach volleyball, badminton, basketball, motorsport, horse racing, shinty, tennis, roller derby and rugby union to golf, Highland Games, boxing, football, cricket, swimming and speedway to ice hockey (and plenty more besides) there’s not a weekend throughout the year without some top-class spectator action taking place. So what are you waiting for? Subscribe now for your free weekly guide to spectator sport in Scotland, and ensure you never miss a sport you love, while discovering new ones you never new you did. Because there’s nothing like being there! There’s a real international feel to this week’s sport with the European Curling Championships all set to go at intu Braehead Arena while in rugby union Scotland’s men and women are in both action, and from Wednesday the Emirates Arena will host badminton players from all over the world in the Scottish Open Grand Prix. In rugby union Scotland Women meet their Spanish counterparts this evening under the Scotstoun Stadium floodlights. The stakes are huge in the first of two matches between the nations over the next 8 days to decide who will join the 12 teams competing at the Women’s Rugby World Cup in Ireland next August. Kick-off is at 7.35pm, tickets are available online and at the turnstiles priced: Adults £5/U18s free. At BT Murrayfield the Autumn Test matches continue with Scotland v Argentina from 5pm on Saturday, the home side looking to to get the sense of déjà vu from last week out of their system after Australia once again inflicted a narrow defeat, this time by 23 points to 22. It won’t be easy against a Pumas side who finished 4th in the 2105 Rugby World Cup. Tickets available online and also from the Murrayfield box office on the day. The waiting is over for the 2016 Le Gruyère AOP European Curling Championships with the best nations in Europe ready to take to the ice. Play starts on Saturday with the round-robin stages throughout the week ahead of the semi-final stages and medal matches from Thursday to Saturday. With the top eight teams qualifying for the World Curling Championships and title of European champions up for grabs, there’s all to play for. Scotland women’s and men’s teams are led by Olympic and world medallists Eve Muirheadand Tom Brewster respectively and with both teams ranked No.4 in the world they have a great chance of being in the medal mix. Each side plays a guaranteed nine matches in the round robin stages meaning there’s plenty of opportunities to see them in action, this is the full schedule of matches. Tickets are available online. To mark your sporting card the stage is also set at the Emirates Arena for the Scottish Open Grand Prix starting next Wednesday. Stand by for five days of world-class badminton with 296 competitors from 34 nations across five continents taking part in the official test event for next August’s TOTAL BWF World Championships 2017. Tickets are available online and also at the box office. Back to the weekend and there’s also basketball, ice hockey, wrestling and football to entertain you including a showdown between high-flying Glasgow Rocks and leaders Leicester Riders in the BBL and a night of Insane Championships Wrestling at The SSE Hydro. For a full rundown of all the action check out these Saturday and Sunday links. Enjoy! THANK YOU for subscribing to SportonSpec! Do you have a friend, colleague or member of the family you feel is missing out by not being in the Scottish sporting loop? Please do forward this email to them if so and tell them to subscribe at sportonspec.co.uk! © Sport On Spec Ltd.
details onto third parties. You may unsubscribe at any time by clicking here.